Shizz Alston and the Owls, who finished the regular season with a 23-8 overall record and 13-5 record in American Athletic Conference play, are aiming for a spot in the NCAA Tournament. Since the preseason, Temple senior guard Shizz Alston has been obsessed with returning to the NCAA Tournament. 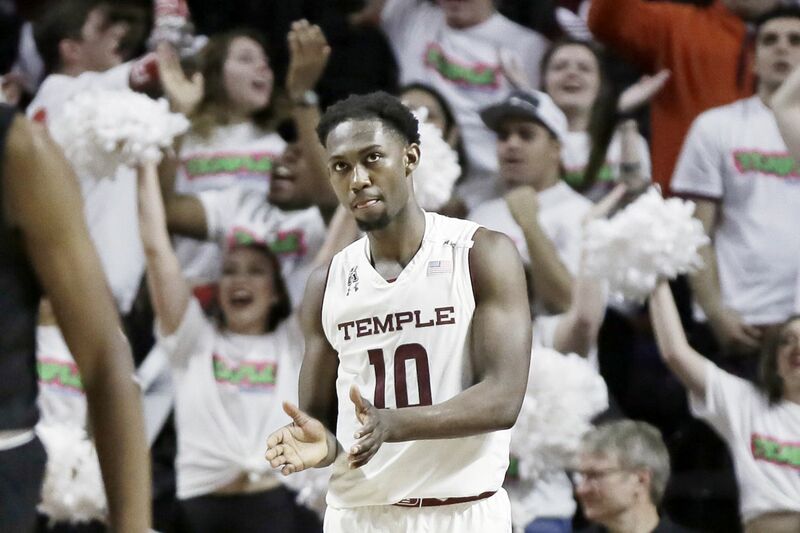 Alston made it to the big dance in his freshman season, but in a way, it was an unsatisfying experience on two counts -- Temple lost its opening game and Alston barely left the bench. Both Alston and Temple have come a long way since. Alston became a starter in his sophomore season. Temple struggled the last two years, going 33-32 with one NIT appearance, but Alston was highly productive, averaging 13.9 points as a sophomore and 13.3 as a junior. This year, the Owls have enjoyed a resurgence and Alston has been at the forefront of the success. At 19.7 points per game, Alston is tied for the scoring lead in the American Athletic Conference. His .906 free throw percentage is first in the AAC. Alston is also third in assists, averaging 5.1 per game, eighth in steals (1.5 per game) and 15th in three-point shooting percentage (.351). He has made at least one three-pointer in a school-record 42 straight games. On Monday, Alston was named first-team all-AAC. Even though three players were unanimous picks and Alston was not, a league spokesman said the all-conference team selections and player of the year are separate votes. So Alston should be a player of the year candidate. The award will be announced on Wednesday. Much of Alston’s success could be attributed to how he handled his freshman season when he averaged 10.1 minutes per game. But even that was misleading. Much of the playing time came early in the campaign. By the end of the season, he was basically doing mop-up time. Alston played two minutes in the Owls’ 72-70 overtime loss to Iowa in an NCAA tournament game at the Barclays Center. Alston was a hotshot local recruit from the Haverford School, where as a senior he was named the Gatorade Pennsylvania Player of the Year. In his first college game, playing against the preseason No. 1-ranked North Carolina Tar Heels, Alston scored 12 points in 15 minutes of a 91-67 defeat at the U.S. Naval Academy. Yet as the season progressed, his minutes decreased. Temple's Shizz Alston drives around Central Florida's Tacko Fall during the second half of the Owls' 67-62 win Saturday at the Liacouras Center. That thinking didn’t change when he received meaningful minutes in the first few games of the season. He was working hard, but Temple had a veteran team with seniors such as leading scorer Quenton DeCosey, Jaylen Bond, and Devin Coleman. Bond and Coleman had been transfers, beginning their careers at Texas and Clemson, respectively. Alston said transferring wasn’t even an option. “That was not even in my mind,” he said. He was a Temple fan all his life, and riding the pine wasn’t going to change that. His father Levan, played on two Temple NCAA Tournament teams in the ’90s after beginning his college career at the University of New Orleans. “Having Temple go to March Madness was the biggest thing in my household growing up,” he said. “I just want to get back to that for the fans, the alumni, for coach [Fran Dunphy] and for everyone on the team to experience it,” he said. And Alston and Temple are on the verge of reaching that dream. Most bracketologists have the Owls in at this point. The Owls are 23-8 and finished 13-5 in the American Athletic Conference. They are the third seed in this week’s conference tournament, which begins Thursday in Memphis. Temple has a first-round bye and will play the winner of No. 6 Wichita State and No. 11 ECU in Friday’s 9 p.m. quarterfinal. In his and Dunphy’s final season, Alston has at times carried the team. Just this past week in two critical games for a Temple team that has been on the NCAA bubble seemingly for weeks, Alston was at his best. He scored a career-high 34 points in Thursday’s 78-71 win at UConn. Two days later, he recorded 21 points and six assists in the Owls’ 67-62 win over visiting UCF, a team that had won consecutive games over ranked opponents Houston and Cincinnati. As the stakes have increased, so has Alston’s production. “I think he really wants to win and drag his team to victory, and I am really proud of those accomplishments on the court, but obviously the things he does off the court are impressive as well,” Dunphy said. Alston always seems to have a smile on his face, but it shouldn’t mask his competitive nature. When the chips are down, he can be a bulldog. Going through his freshman season wasn’t the most pleasant experience, but Alston learned from it. Every year, he seemed to bring back something different in his game. This year, it is the step-back three-pointer, a shot that is virtually impossible to block. The biggest difference is that Alston’s confidence is at an all-time high. “I have more confidence in myself and Coach has more conference in me,” he said. That is such a drastic change from his freshman year, a low point that Alston learned from so he could become the driving force for a memorable senior season.